District’s retail industry is relatively small: it accounts for just under 3 percent of all employment in the District compared to about 9 percent in the Metro area and 11 percent in the nation. But this sector is changing rapidly in what it sells, how it sells it, and whom it hires to sell. 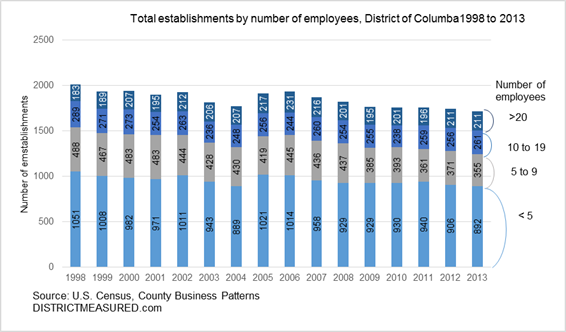 Retail establishments in the District are employing more people than they ever did before. In March of this year, District retailers employed 22,500 workers—a third more than they did in 1998. Most of this growth, however, is recent. 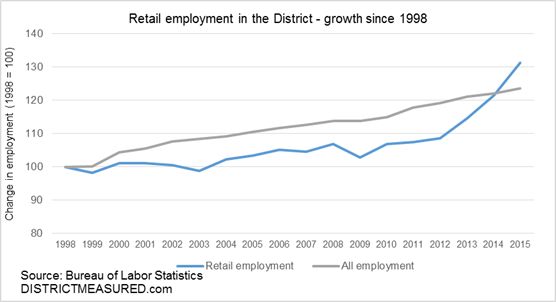 Between 1998 and 2009, the retail sector employment growth was tepid and lagged behind overall employment growth in the city. This changed after 2010 following the rapid population growth. As large retail stores, supermarkets, and wholesale shopping clubs like Costco began moving into the city, the retail sector added 4,000 new employees. This represents a growth of over 23 percent between 2010 and 2013, four times faster than the rate at which overall District employment grew during this period. Retail sector today is also more consolidated. Despite the growth in total employment, we have fewer retail establishments: 1,700 in 2013 compared to over 2,000 in 1998 and an average retail establishment now employs nearly 12 workers compared to about eight in 1998. The mom-and-pop stores with fewer than five employees are still the majority of retail establishments in the District (52 percent both in 1998 and 2013), but they are now down by about 15 percent in numbers since 1998. One quarter of establishments with five to nine employers are gone: the number of such stores declined from 488 in 1998 to 355 in 2013. During the same period, the number of establishments that hired 20 or more employees increased from 183 to 211 (but with fluctuations suggesting large turnover even among these establishments) and these mid- to large-sized stores are now 20 percent of all retail establishments, compared to 17 percent in 1998. How about sales? Annual data on sales are not publicly available, but the quinquennial Economic Census allows us to look at the 1997 to 2012 period. This data show that retail establishments sold $4.4 billion worth of goods in 2012, up 13 percent since 1997 after adjusting for inflation. Almost all of this growth happened since 2002, especially between 2002 and 2007. District’s retail landscape also changed: sales shifted from general merchandise and big-ticket items such as building materials to food and drinks, personal items and clothing, and furniture and home decorating items. For example, in 1998, the District had about 30 general merchandise stores (including four department stores) which collectively accounted for 6 percent or retails sales and hired 1,400 (part time or full time) employees. In 2012, we had so few of such stores that the Census did not disclose their data. We lost 20 establishments that sold old or new cars or vehicle parts. These stores used to account for five percent of all sales volume, but now are of little significance. We lost 30 stores that sell books or other print materials, half the hobby stores (left with ten), and over a third of our gas stations. On the up side, we had 22 more grocery stores in 2012 compared to 1998 (and have added more since) and pet stores are up from 3 to 10. Pharmacies, drug stores, perfumeries, and beauty stores now account for one fifth of the retail sales compared to one-tenth in 1998. We have more places we could shop for athletic shoes or yoga clothes and the sales volume of these stores increased by over 30 percent. Despite the growth in the retail sector sales and employment, total payroll at retail establishments remained stagnant and earnings per employee, after adjusting for inflation, do not appear to have increased. In 1997, a retail worker in the District took home what would have been the equivalent of $25,642 today. 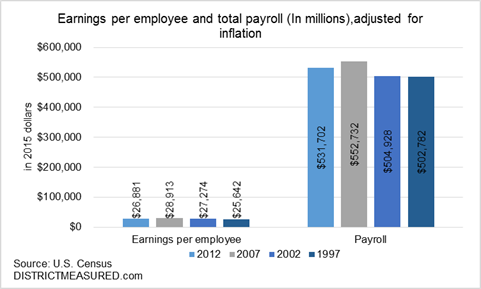 In 2012, earnings were up by only about $1,000 compared to 1998, but down from earnings from 2007, which stood at $28,913. Why are the wages in the District’s retail sector going down? There could be multiple reasons for this. May be it is a reflection of what is going on in the entire economy: wages remained stagnant in all industries following the Great Recession, and perhaps retail was not immune to this trend. Data on wages earned in retail in the nation and the District shed some light: In 2012, the median hourly wage of retail workers across the nation, measured in today’s dollars, was $12.43, down almost 75 cents (or six percent) from five years earlier. Median hourly wages fell in the District too, but by even more: In 2013, median hourly wages were down to $14 from $16.4 in 2007 (in today’s dollars), or by about 15 percent. 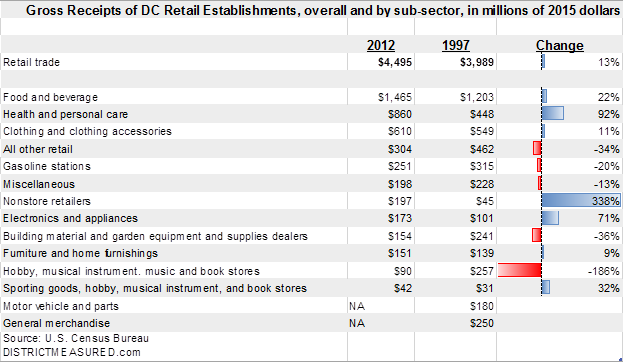 This suggests that additional factors might be depressing employee earnings in the District’s retail sector. Are stores moving to part-time workers to reduce costs? We could find no evidence to support this. According to data from the American Communities Survey, the share of retail workers who work full-time has been stable, at 83 to 84 percent through the Great Recession and after. Finally, it is possible that retail is paying less because people who work retail in the District are younger, less experienced, or less qualified in some other way. Data from American Communities Survey in the District reveals some interesting trends. For example, in 2013, the average retail worker in the District was about 37 years old (not that different from the national average). That is three years younger than the average age in 2007, but it is hard to image that an additional three years of experience after mid-thirties would have such a big impact on wages. As a side note: nearly half of District’s retail workers do not live in the District. In 2013, about 47 percent of retail workers in the District were District residents. 38 percent commuted from Maryland and 15 percent from Virginia. Incidentally, DC residents who work in retail are younger than their commuter colleagues at the age of 34 compared to 37 for those coming from MD and 44 for Virginians who work retail in the city. These shares and differences in ages are comparable to what we had seen in 2007. Most retail workers are paid under $15 per hour–the focal point of the minimum wage debate in the nation and the District. This makes us wonder: who earns low wages in the District and where do they live? What are some of their characteristics (age, work habits, educational attainment)? We are digging deeper into these questions and will post our findings soon. Employment numbers are from Bureau of Labor Statistics, Regional and State Employment and Unemployment (Monthly). The number of establishments refer to a store in a single location–that is stores that belong to a chain each count as a separate establishment. This data come from Census Bureau’s annual Country Business Patterns. Gross receipts and payroll data come from the Economic Census,which recently released the 2012 Census data for the District of Columbia. The data on the full-time and part-time status of the retail workers in the District, as well as the age and residence of these workers come from the American Communities Survey’s 1-year PUMS data for the District, Maryland, and Virginia for the years 2013 and 2007. This year, Labor Day falls on its latest possible day, September 7th. This hasn’t happened since 2009 and District of Columbia Public and Charter Schools will already have been in session for two weeks when the holiday travel weekend arrives. The American Automobile Association estimates that 35.5 million Americans, including 850,700 in the D.C. area, will travel over the holiday weekend; a slight increase over 2014, but likely tempered by the late date. Will you be traveling, having a staycation, or will folks be coming to visit you? 87 percent of travelers will do so by car and will be wondering about gas prices. 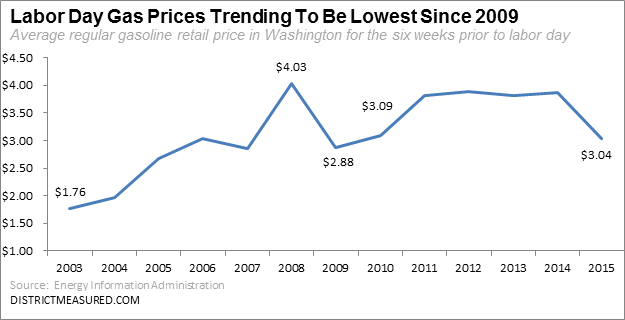 We took a look at the retail regular gasoline price averages in Washington, D.C. for the six weeks leading up to Labor Day since 2003 and we are on track to have the lowest average gas price since 2009 when the average price was $2.88. The last five weeks have averaged $3.04, so barring any significant price jumps or drops in this last week before Labor Day, we will average close to the 2010 six week average price of $3.09. Travelers will likely greet this price far better than they have the average for 2011 through 2014 which was $3.84. The graph below represents the average price for the six weeks prior to the Labor Day holiday every year since 2003. The six week average peaked in 2008 at $4.03 and was at its lowest point over this period in 2003 at $1.76. Note: 2015 includes the five week period of July 28, 2015 to August 31, 2015. Happy and safe travels to you all. What is this data? The travel data comes from the American Automobile Association’s 2015 Labor Day Travel Forecast. The regular gasoline price data is assumed to be a per gallon price and is derived from the U.S. Energy Information Administration’s weekly retail gasoline prices for Washington.